The Black-billed Nightingale-Thrushes (Catharus gracilirostris) - also known Slender-billed Nightingale-Thrushes - occur naturally in Central America. These birds are prolific singers and males, in particular, are known for their highly melodic songs that are heard over long periods. In spite of their remote habitats, these birds have shown to quickly grow confiding. 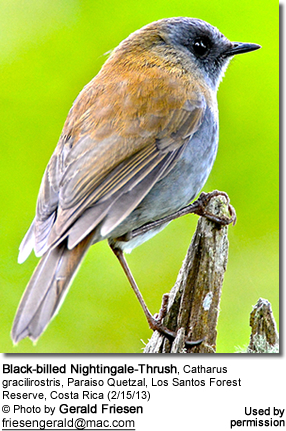 The Black-billed Nightingale-Thrushes are found in central Costa Rica - specifically in the area of Cordillera de Talamanca where populations exist at the Poás, Barva, Irazú and Turrialba volcanoes. Their range extends southeast into western Panama to the province of Chiriquí at the western coast of Panama. They are common resident (non-migratory) birds within their limited range of only about 1500 sq. miles (3800 square kilometers). These Thrushes are restricted to the wet montane evergreen (oak) forests and thick páramo shrubs from about 4,500 feet (~1,350 meters) up to the timberline. As they search for food, they also visit adjacent open areas, including pastures, roads and trails. This medium-sized, chunky thrush measures 5.4 to 6.3 inches (~ 13.5 - 16 cm) in length, including the tail. The average weight is 0.7 ounces (~21 grams). The upper plumage is olive-brown, turning slightly reddish on the tail. The crown and the cheeks are grey. They have pale grey eye-rings. The plumage below is whitish except for the grey flanks and greyish-brown chest with darker spots. The eyes (irises) are dark brown. The immature bird has a darker, sooty grey head and throat and is darker below. The upper plumage is duller and more orange tinged than that of the adult. The wing coverts (feathers) have pale edges. It has a brown chest band. The abdomen is marked with brown. There is a washed spotting on the chest and the upper abdomen. The Grey-cheeked Thrush is slightly smaller. Black-billed Nightingale-Thrushes mostly feed on insects (both adult and larvae), spiders, small fruits and berries - alone on in pairs. Most of the prey is swallowed whole. They construct bulky cup nests out of vegetation, such as mosses and roots. The nests are lined with grasses, lichens and small rootlets. Nests are generally placed in concealed locations, about 3 - 16 feet (~ 1 - 5 meters) high in small trees or in scrub. The typical clutch consists of two greenish-blue eggs with brown marks. Its call is a high thin seet.